Time to jump into our list for online guitar lessons for kids! We decided to focus on online learning because it is a cost-effective. Also, it is a convenient way to gauge your child’s interest before committing to expensive private or group lessons. These sites offer excellent opportunities for learning a new skill without breaking the bank. ​Guitargate is a solid choice for musically inclined kids who will also benefit from learning music theory in addition to guitar skills. ​Guitareo is a good fit for a child who already has an established interest in learning guitar, plus its 90-day money back guarantee makes it easy to try out. ​GuitarLessons.com is a solid choice for kids who have shown interest in playing guitar but may not be ready to commit to a full-blown paid series. Little Kids Rock is a great free learning site for younger kids to try out learning guitar before upgrading to another site with paid content. Kids Guitar Zone is a good option for younger kids looking to try guitar for the first time. Guitar Tricks offers a comprehensive site for children and adults to learn guitar while keeping lessons fast, easy, and fun. The site has a library of over 700 songs and 11,000+ lessons. Each lesson features multiple camera angles and works to slowly build up skills. Thus, the learning process stays fun and not overwhelming. Recommended for: Guitar Tricks is the best overall option for online guitar lessons for kids. Additionally, with the wide range of lessons, it could be an excellent opportunity for the whole family to learn together. Learn skills such as basic strumming, reading music, power chords, and chord changes and timing. Plus, if you get stuck on a lesson, they have online instructors ready to jump in and help. 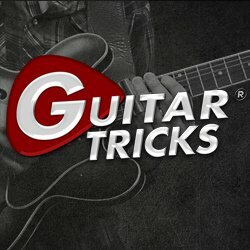 Guitar Tricks also has a 60-day guarantee on the full access membership, making it risk-free and easy to try. The price, though not that steep, can be a deal breaker for some especially when there are free options available. Guitargate is hosted by Michael Palmisano and offers content that ranges from total beginner to high-level music theory. 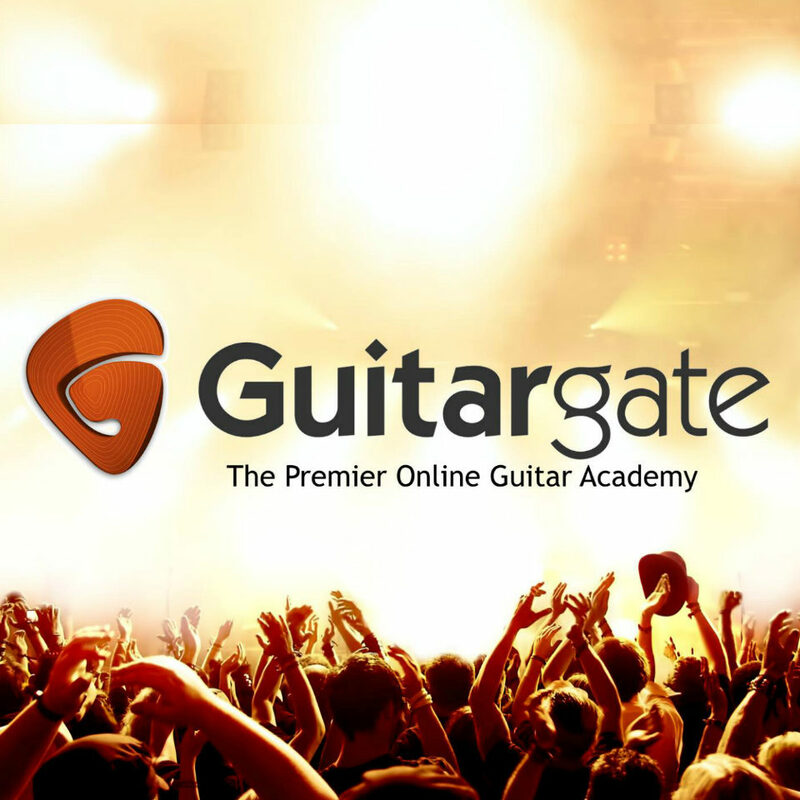 The Level 1 – Welcome to Guitargate course is totally free. It provides a risk-free way to try out the site and see if it’s a good fit. The 16 lessons in this tutorial are designed for total beginners. Also, it goes over basics such as how to hold a guitar, beginning chords, and practice routines. Recommended for: Guitargate is a solid choice for musically inclined kids. They will benefit from learning music theory in addition to guitar skills. If you decide Guitargate is the best option for your child, definitely consider the monthly membership. It comes with weekly live sessions and instructor video feedback. This personal attention sets Guitargate apart from the other options. Guitareo is focused on creating easy-to-follow tutorials for anyone, including kids, to learn how to play the guitar. The site features courses organized by topic with step-by-step lessons.It tracks your progress and allows you to easily pick up right where you left off. Recommended for: Guitareo is a good fit for a child who already has an established interest in learning guitar. Its 90-day money back guarantee makes it easy to try out. Featured topics include guitar fundamentals, playing your first song, reading music, practice tips, and ear training. It is designed to have students apply what they are learning with song tracks orchestrated to emphasize the lesson. Best for kids who has a good background at playing the guitar. Beginners may find the lessons too advanced for them. GuitarLessons.com is the free counterpart to Guitareo and offers lessons for both acoustic and electric guitar. Their Beginner Guitar Quick-Start Series will provide a solid foundation for future lessons on any platform. Recommended for: A solid choice for kids who are interested in playing guitar but are not yet ready to commit to a full-blown paid series. 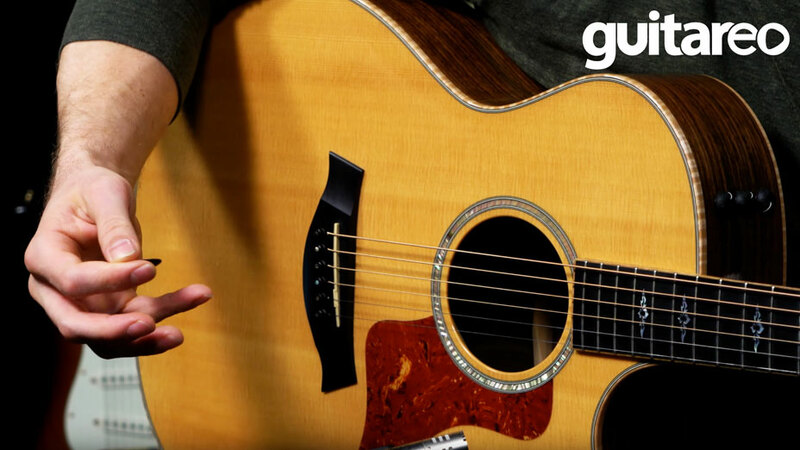 The lessons feature learning the parts of the guitar, tuning a guitar, strumming technique, and building your first guitar chords. The website design is clear and easy to follow with a very straightforward progression of material. May not be the best option for advanced students. 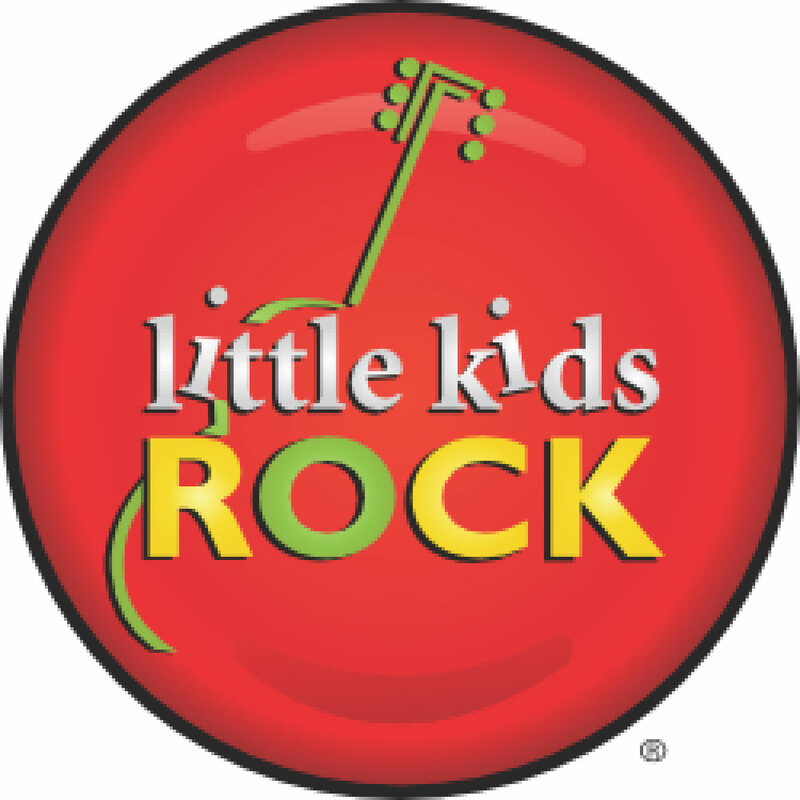 Little Kids Rockis dedicated to making learning an instrument easy and accessible to all. Plus, the online program is connected to a non-profit by the same name that strives to make music education a staple in U.S. public schools. This site is geared toward younger kids and is a solid option for them to get their feet wet. Recommended for: Little Kids Rock is a great free learning site for younger kids to try out learning guitar before upgrading to another site with paid content. In addition to basic lessons, their method also features “Jam Tracks,”. It allows students to practice their skills along with pre-recorded tracks with piano, bass, and drums. t provides a solid foundation for any kid looking to play the guitar. Advanced kids who has attended similar programs will find the lessons to be monotonous. Hub Guitar features over 500 lessons that are focused on studying the fundamentals of playing guitar. As well as building a solid foundation one step at a time. As you move through the lessons, there is a mix of video and written material used to teach individual techniques. Recommended for: Hub Guitar is another solid choice for kids to try out the guitar in a low-risk environment. While there isn’t as much content as some of the other paid sites, it has a simple layout that makes it easy to follow. 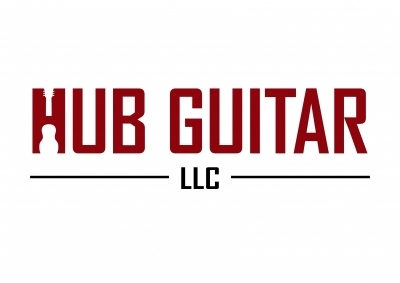 Hub Guitar is another excellent free guitar lesson site. The well-organized content makes it easy for kids to navigate, plus, videos can be sorted by skill level or topic. Depending on how familiar your child is with the guitar, he will want to start on the Basic guitar levels. Content is not as vast compared to other paid sites. Kids Guitar Zoneis designed 100 percent for kids and is dedicated to keeping all its content kid-friendly. The site focuses on teaching guitar basics in bite-sized lessons. Such as how to hold and tune a guitar and how to read tabs. Also, it will have your child learning popular songs while learning guitar chords and strumming technique. Recommended for: Kids Guitar Zone is a good option for younger kids looking to try guitar for the first time. 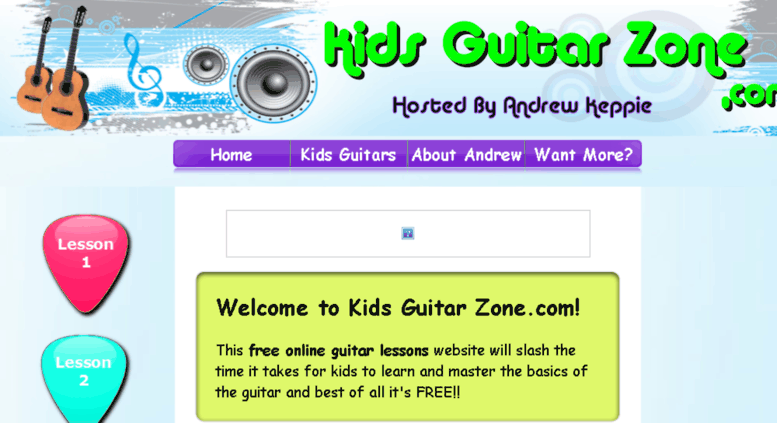 ​Kids Guitar Zone is hosted by Andrew Keppie and also includes a guitar buying guide. It is great if you have yet to purchase a guitar. While the site may be free, the styling and quality of the video content may not be the best for keeping your child engaged. Before we launch into the rankings, here are some insight into how each guitar lesson site was evaluated. The ratings below come from looking at customer reviews and testimonials. As well as any existing data about the product or service offered. Accuracy and honesty are very important, and we asses all these factors, including general brand reputation, to determine each rating. Below is a breakdown of the criterion used for the ratings. Value-to-Cost Ratio: The sites reviewed in this list are a mix of both free and subscription-based models. Essentially, a site’s value-to-cost ratio compares how much a membership or lesson costs with the quality and depth of the material. 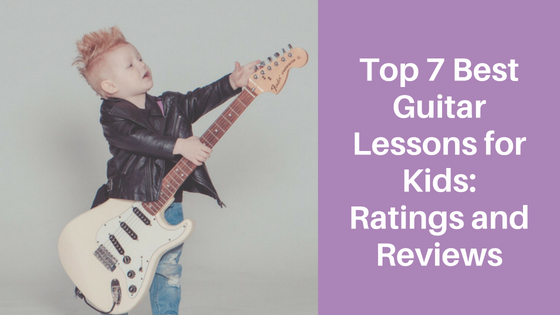 Material and Ease of Use: Since we are reviewing the best guitar lessons for kids, we wanted to make sure the sites were easy to understand and navigate. Also, the material covered was appropriate for children. Please note that websites can change policies and content. Thus, it’s wise to double check before moving forward with lessons to make sure they fit with your family’s values. Customer Reviews: Reviews from people who have tried a service before are valuable when it comes to choosing a guitar learning platform. Hopefully, the opinions included below will make you even more confident with your final selection. Time Commitment. Learning a new instrument takes a lot of time and practice. If your child is new to playing guitar, start off with a free or lower-price option to gauge interest. Once he or she sticks with it, then determine if a high price-point site or course is right for you. Lesson Structure. Everyone learns differently, so pay attention to the way a site structures their lessons and see if it matches your child’s learning style. Even the best guitar sites can be a struggle if the teaching style does not mesh with your child. Money Back Guarantee. Double check a site’s money back guarantee policy before you sign up for a subscription. This is a great fail safe just in case you or your child change your minds a week or two down the line. Have fun! Remember that learning and playing music are fun ways to challenge a child and encourage growth. Consider making learning a family affair and enjoy diving into something new! Hopefully this guide has helped you narrow down the options for online guitar lessons. We wish you success and happy strumming! However, if guitar isn't your child's cup of tea, he may want to look at learning how to sing. Or in other cases, how to play the piano.